A Paper Garden: Another card class! I just got these Watercolor Garden Stamps from Art Impressions in the Paper Garden Projects store. I started playing with them and had so much fun I decided to design my whole card class around that set! Really - they are just so fun! Its a series of clear images that you create garden scenes with. You stamp with dye inks on watercolor paper and then use a water brush to blend and mute the colors. It just takes minutes to create these wonderful little watercolor scenes. 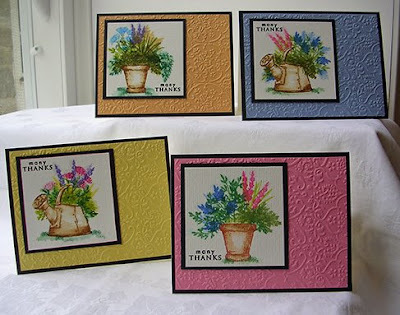 For these cards, I used Ranger Distress inks and the new Memento Dye inks. So for this class we are making a set of thank you notes and packaging them up in a clear gift box. Cute huh? 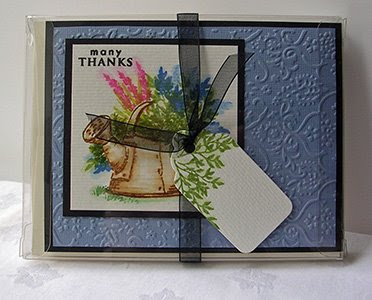 The embossed card uses the beautiful Victorian Flower stamp from Impression Obsession. Its embossed in copper and the background paper is Bazzill Bling. The classes are the evening of May 1 and 2. There are still some spaces left, so if you are in the Philadelphia area and would like to join a fun group of stampers - just let me know! These are absolutely beautiful! It's hard to believe when you say they're not difficult because they appear to be! I bet your class will be a great success! 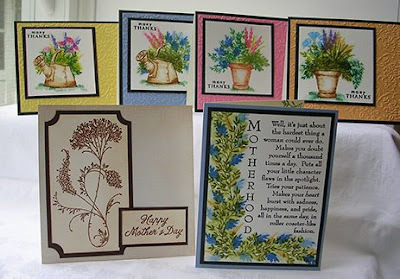 Lovely cards, just lovely! Wish I could come play in your class. These cards are all so beautiful. Very vibrant colors! Hiya Cathrine! : ) These are really beautiful! I love the backgrounds! The stamps are too much fun too! Hope you are doing well! WOW! I just bought a bunch of Art Impressions stuff after doing a neat make-it, take-it at Pennsauken- and now you have them here- and ones I DON'T have- there goes the budget again, lol! And, I will be away on those dates and can't get to the classes- BOOHOO! Anyway- these are fun and wonderful! Wow, Cathrine, these are STUNNING. I have watercolor paper and always forget about it. I hope to have time soon to try this technique, just gorgeous! Very nice cards. What a great class you planned!